Pack Of 10 The EZ-RJ45 have been designed so you are able to use solid or stranded CAT5E OR CAT6e ca.. Pack Of 100 The EZ-RJ45 have been designed so you are able to use solid or stranded CAT5E OR CAT6e c.. Pack Of 1000 The EZ-RJ45 have been designed so you are able to use solid or stranded CAT5E OR CAT6e .. Pack Of 20 The EZ-RJ45 have been designed so you are able to use solid or stranded CAT5E OR CAT6e ca.. Pack Of 200 The EZ-RJ45 have been designed so you are able to use solid or stranded CAT5E OR CAT6e c.. Pack Of 25 The EZ-RJ45 have been designed so you are able to use solid or stranded CAT5E OR CAT6e ca.. 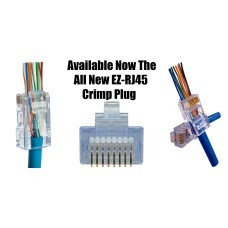 Pack Of 5 The EZ-RJ45 have been designed so you are able to use solid or stranded CAT5E OR CAT6e cab.. Pack Of 50 The EZ-RJ45 have been designed so you are able to use solid or stranded CAT5E OR CAT6e ca.. Pack Of 75 The EZ-RJ45 have been designed so you are able to use solid or stranded CAT5E OR CAT6e ca..